Cash flow Statement | Here is the solution for you! Stop Waisting your Money and Start your Savings Now! Do you commonly find yourself running out of money before your next paycheck has deposited into your bank account? Are you tired of trying to balance your budget to no avail? Do you find that trying to save your money is a road that always leads to a dead end and worry that it won’t get better? Why do you need a Cash flow Statement? Stop wasting your Money and Start your Savings! This Cash flow Statement is an easy and Powerful Tool to control your money flows. It will help you Monitor, Control and Manage your Budget, Income and Expenses. It will help you to Stop Wasting your money and Start your Savings! You can forecast your future financial position and helps you predict whether you, your family or your business will have enough cash to meet your obligations. Puts you in control of how to manage your cash flow. You do not have to be an accountant to know your financial position! You do not have to be an accountant to enter your entries! No debit no credit. No left or right column. Just enter the amounts in one column ONLY! ALL OTHER CELLS, SHEETS, REPORTS, CUMULATIVES, COMPARATIVES, STATISTICS and CHARTS are AUTOMATICALLY POPULATED. All worksheets are automatically linked together so figures only need to be entered once! Daily Cash flow Statement is a handy expense manager spreadsheet software for your computer or tablet. With the help of this cash flow statement spreadsheet software you can keep an eye on your income, expenses, credit cards and bank accounts. It is specially build for small businesses and home users. You can easily maintain, calculate, lets you take control, analyze, manage and keep a track of your household or any expenses in general, on a daily, weekly, monthly and annual basis easily. This expense manager spreadsheet software can be downloaded to Windows PC. This software offer various features, like: manage and analyze your household daily and monthly expenses, keep a track of your daily, weekly, monthly and yearly expenses easily, make analysis of your expenses in various categories to create strategy for decreasing your expenses, keep a record of your transactions, generates various kinds of reports and graphs and you can name your spreadsheet files with your different bank accounts, credit cards or even to have a separate workbook for your car expenses, utility expenses etc. etc. Enter information into the lighted yellow cells in the “Input Data” sheet ONLY! Choose from the user form, the date, your Income or Expense category and enter the amount. ALL OTHER CELLS, SHEETS, REPORTS, CUMULATIVES, COMPARATIVES, STATISTICS and CHARTS are AUTOMATICALLY POPULATED. All worksheets are automatically linked together so figures only need to be entered once! Developed by more than 23 years of experience in VBA, MS Excel, MS Access and MS Word, developer and Financial planning & Data Analyst. You can keep a track of your daily, weekly, monthly and yearly expenses easily. This spreadsheet software lets you make various categories of your expenses e.g. expenses on home, education, kids, food, cars etc. Save time, money and energy! Basic Charts – Cash Balance at the end on each month, Cash Receipts per month, Cash Payments per month. Statistics – It is a 5 Years Monthly Comparative Report showing a category of your Income and your Expenditure along with a Chart for that periods. This category consists of up to 5 sources of income or revenue descriptions. (examples given can be altered or deleted). This category consists of up to 27 categories of expenses. (examples given can be altered or deleted). The difference between the cash receipts and the cash disbursements for each period. Day, week, month or year. Inflows minus Outflows, give us the Net Cash Flow. Cash on hand plus Net Cash flow, gives us the Cash Balance at the end of a that specific period. Daily, Weekly, Monthly and Annual Reports and compares them to the previous years values. Daily, weekly, monthly and Annual Graphs and Charts showing your cash balance and movement along with a Pareto graph showing the 5 Largest Outflows Categories for each year. Daily, weekly, Monthly and Annual comparative statistics for each category. Finances Are Finally Easy To Control! With our system, the power is in your hands! You enter information into the lighted yellow cells in the Input Data sheet ONLY! ALL OTHER CELLS, SHEETS, CUMULATIVES, COMPARATIVES, STATISTICS and CHARTS are AUTOMATICALLY POPULATED. All worksheets are Automatically linked together so figures only need to be entered once! 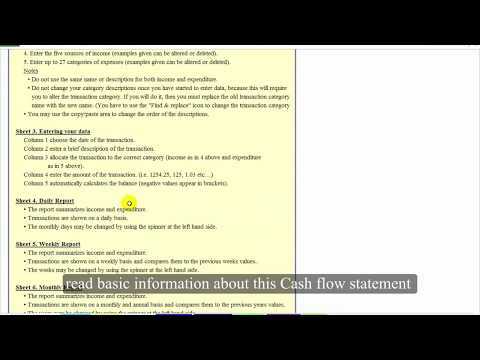 How this Cash flow statement works. Enter the name you wish to use (Personal, Company, Acc.#, other). Enter the five sources of income (examples given can be altered or deleted). Enter up to 27 categories of expenses (examples given can be altered or deleted). Do not use the same name or description for both income and expenditure. Do not change your category descriptions once you have started to enter data, because this will require you to alter the transaction category. If you will do it, then you must replace the old transaction category name with the new name. (You have to use the “Find & Replace…” icon to change the transaction category). You may use the copy/paste area to change the order of the descriptions. The workbook is at manual calculation mode so if for any reason the calculations are not calculating then click the “Refresh” button or go back and forth between the worksheets to calculate the workbook. Column 1 choose the date of the transaction. Column 2 enter a brief description of the transaction. Column 3 allocate the transaction to the correct category (income as in 4 above and expenditure as in 5 above). Column 5 automatically calculates the balance (negative values appear in brackets or with minus (-) sign ). The report summarizes income and expenditure. Transactions are shown on a daily basis. The monthly days may be changed by using the spinner at the left hand side. Weekends are shown with light yellow shaded columns. Transactions are shown on a weekly basis and compares them to the previous weeks values. The weeks may be changed by using the spinner at the left hand side. Transactions are shown on a monthly and annual basis and compares them to the previous years values. The years may be changed by using the spinner at the left hand side. Chart 1 shows the Cash Balance at the end on each month. Chart 2 shows the Cash Receipts per month. Chart 3 shows the Cash Payments per month. The charts show the Five Largest Expenditure transactions per year. It is a 5 Years Monthly Comparative Report showing a category of your Income and your Expenditure along with a Chart for that periods. The income and expenditure may be changed by clicking on the light yellow shaded cell. Please note that this program is designed to run on Windows and requires MS Excel 2007 or higher. This WILL NOT work for Apple MACs. The Daily Cash flow Statement spreadsheet software is provided in electronic form only. Join our newsletter for New Spreadsheets by us! Stop waisting your Time and Money and Start your savings! Copyright © 2018 WwW.DailyCashFlowStatement.Com All Rights Reserved.